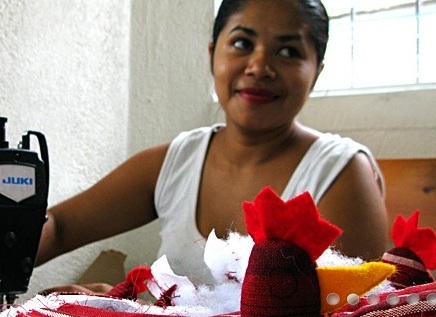 In honor of Fair Trade Month, Angela Mercedes Bailon, a fair trade artisan from Guatemala will come to Burlington, VT to share her story and educate our community about the importance of fair trade. She is the director of UPAVIM, a non-profit organization that works in the roughest part of Guatemala City to empower women and strengthen community. She is a pillar of strength within her organization and bears witness to the positive impact fair trade makes in the lives many families in her neighborhood. We are excited to offer two opportunities to come hear her speak. In February, St. Michael’s College became a Fair Trade University. In honor of Fair Trade Month, they are hosting a marketplace where guests can hear from Angela and meet local fair trade companies. 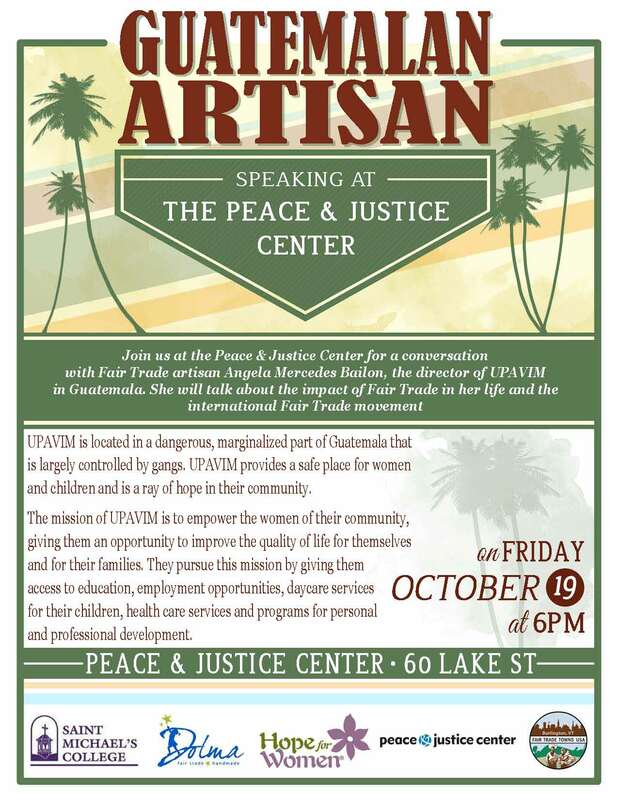 The Peace & Justice Center will host this event in the gallery on the 2nd floor of their building. Angela will share her story and have time to discuss the impact of fair trade. Refreshments will be served. The Fair Trade Artisan Visit was made possible through the efforts of several local businesses and organizations. Supporters include: The Peace & Justice Center, the Fair Trade Burlington Network, Hope for Women, St. Michael’s College, Ten Thousand Villages and Dolma Fair Trade. VT’s 3rd Annual Forum on Fair Trade Business: Chocolate! Chocolate! Chocolate! How is it that in 2012 we can buy dolphin free tuna but not child free chocolate? We will discuss this issue and more at VT’s 3rd Annual Forum on Fair Trade Business, Saturday, September 29, 4:00-6:00pm in Contois Auditorium in Burlington. 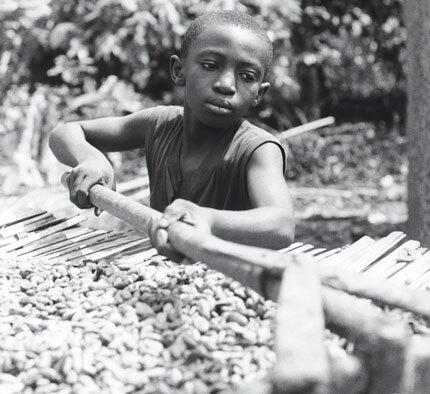 Co-sponsored by Fair Trade Burlington Network and the Peace and Justice Center our focus will be on the issue of abusive labor, especially child slave labor in the cocoa industry and the challenges of sourcing ethical cocoa for making those delicious chocolate treats we all enjoy. The event will include a panel discussion with questions and answers, free samples, vendors, displays and more. Our goal is to raise questions, find solutions and celebrate the companies and organizations that choose a fair and just way of doing business. The Fair Trade Burlington Network is proud to launch our cocoa campaign,- aimed at raising awareness and increasing consumer demand for chocolate that is free of the worst forms of child labor. How is it that in 2012 we can buy dolphin free tuna but not child free chocolate? Over the next few months, we are going to reach out to our community centers, co-ops, houses of worship, schools and universities to educate the Burlington area about the harsh realities of child labor in cocoa supply chains. 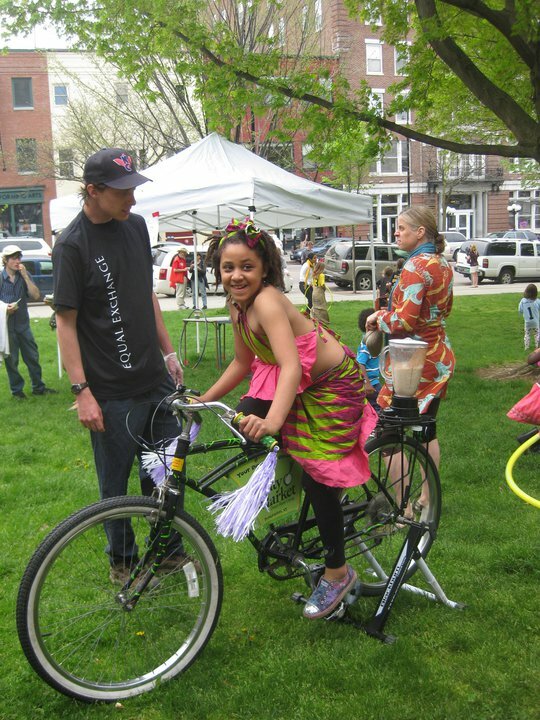 Join the Peace and Justice Center this summer for fun with fair trade. Every Thursday at 10:00am through August 16. 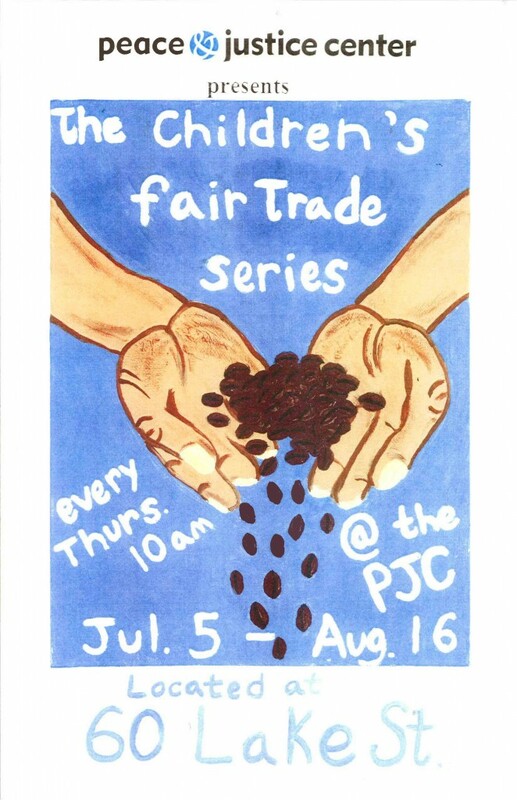 Description: This fair trade event for children will be based around discussing Fair Trade ingredients and will include FREE Ben & Jerry’s Ice cream! We will also read some of Todd Parr’s stories, which highlight different kinds of people and families and promote peace and acceptance. Come join us! The fair trade world is experiencing some growing pains. As your source of information on all things fair trade, we want to share with you some of the issues being discussed. In April, many concerned parties in the fair trade movement gathered for the North American Fair Trade Stakeholders Council just met in Minneapolis. Sandy Wynne was proud to represent Fair Trade Burlington Network in this incredibly important debate/discussion about dealing with the challenges faced by the Fair Trade movement, at the national and international level. This meeting was the beginning of strengthening the movement and clarifying the roles of certifiers. The goal is to raise the bar for everyone, to reinforce the Fair Trade principles, especially transparency and democratic ideals, and to include the voices of all the stakeholders, especially the small producers and workers in the supply chain. Since the Summit, articles have been popping up and we want to share some of the ones we have found to be most helpful in explaining the problem and encouraging dialogue. The Fair Trade Resource Network offers a clear summary of the summit and the goals of the stakeholders. You can find the most current updates on their activities at the Stakeholder Council Page. Fairtrade International, often still referred to as FLO, has created the Multi-Stakeholder Consultative Group for Fair Trade in the U.S. to help strengthen, solidify and grow the Fair Trade movement in the U.S. while staying true to the internationally recognized Fair Trade principles. This group represents a broad range of stakeholders equally participating in this process. Here is a summary from Fair World Project of what is happening in the movement. While there are many concerns, there are also many opportunities as we move forward in our efforts to make Fair Trade stronger and more united in the effort to help alleviate global poverty. “A Schism over Fair Trade” is an interesting article well worth reading and will hopefully motivate some in depth discussion and probing questions. 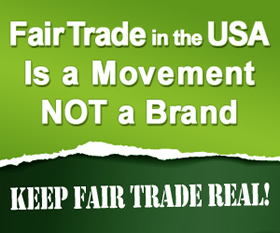 The article presents a variety of opinions and issues we are currently facing in the Fair Trade movement. This is only the beginning of change within the movement. We will continue to keep you informed and we want you to know that we are available to discuss any of your concerns. Given the current crisis in the U.S. Fair Trade movement, we are hopeful that, in the end, we will have a stronger and healthier movement. What are your questions? What are your concerns? Let’s keep the conversation going. Please join us on Saturday, May 12th from 11:00am-1:00pm in City Hall Park, Burlington, VT for a World Fair Trade Day Celebration! Senator Sanders and Mayor Kiss celebrated with us in 2009. 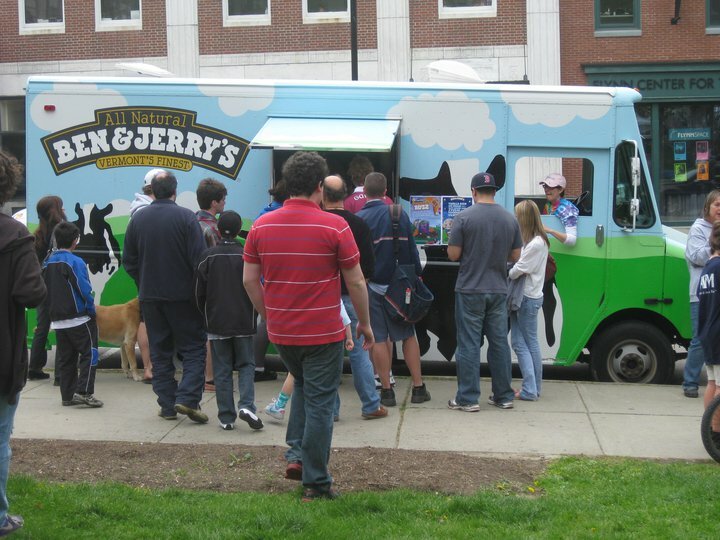 Look for us on the south side of City Hall Park in Burlington (closer to Main St.). Our celebration will be happening at the same time as the Burlington Farmer’s Market. The event is free and open to the public. World Fair Trade Day is a global event that celebrates fair trade and its positive impact by promoting local businesses and organizations committed to making trade fair. 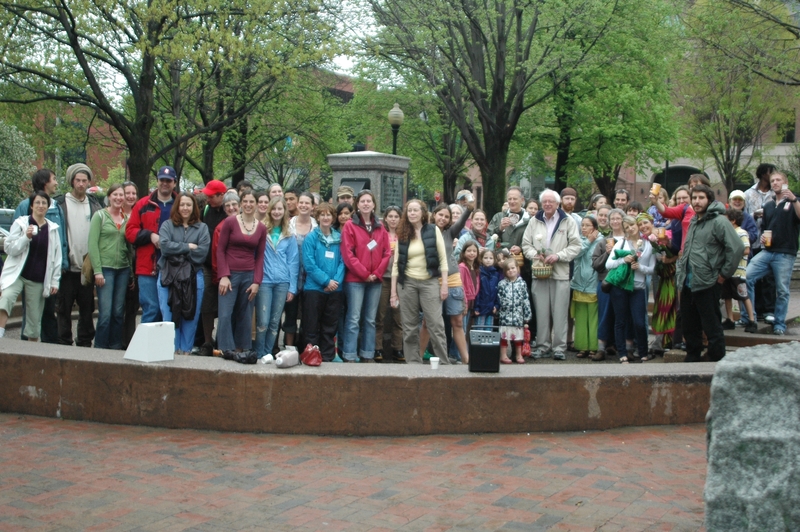 Burlington is the 12th Fair Trade Town in the U.S.A. We aspire to educate our community about the benefits of fair trade in developing countries and to inspire everyone to choose fair trade when possible. World Fair Trade Day is organized by the Peace & Justice Center and the Fair Trade Burlington Network. For more information, please contact Gaby Brenneman: gaby@pjcvt.org or by calling the Peace and Justice Center (802) 863-2345 ext. 3.